From sophisticated through to charming. 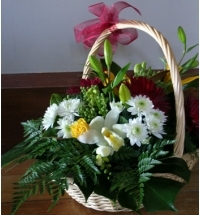 The flowers in a basket are a perrenial favourite from new baby arrangements onwards. You choose the colour combinations if you like - we will carry the story with the desired bunting and bows!